I literally stopped dead in my tracks. Was that a rogue apostrophe on the Sheraton sign? Etched into stone? 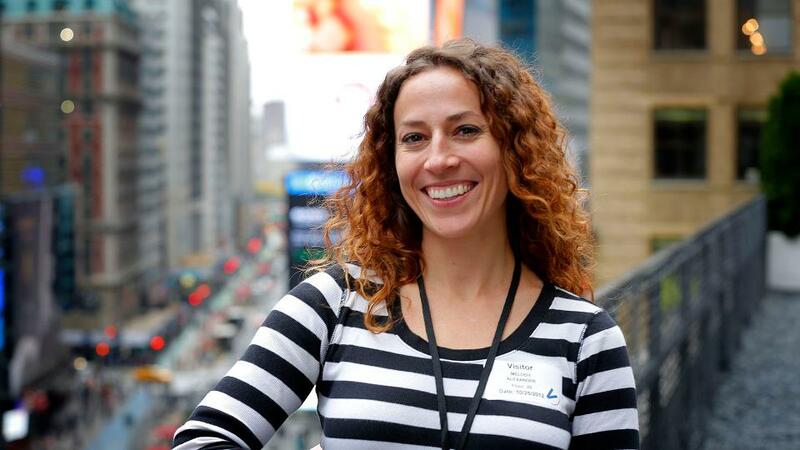 By this time, I had spent a few years working in publishing and advertising. I know, for a fact, that before anything gets printed or, say, etched into stone, it’s proofed by writers, proofreaders, account managers, clients, etc. I’m sure the Sheraton has several of those people working for them. My point? Somebody signed off on the proof. Before it got ETCHED INTO STONE. Secondly, this is such a common mistake, yet it’s actually one of the easiest grammar laws to figure out. You see, the apostrophe has three uses: 1) to form possessives of nouns, 2) to show the omission of letters, and 3) to indicate certain plurals of lowercase letters. 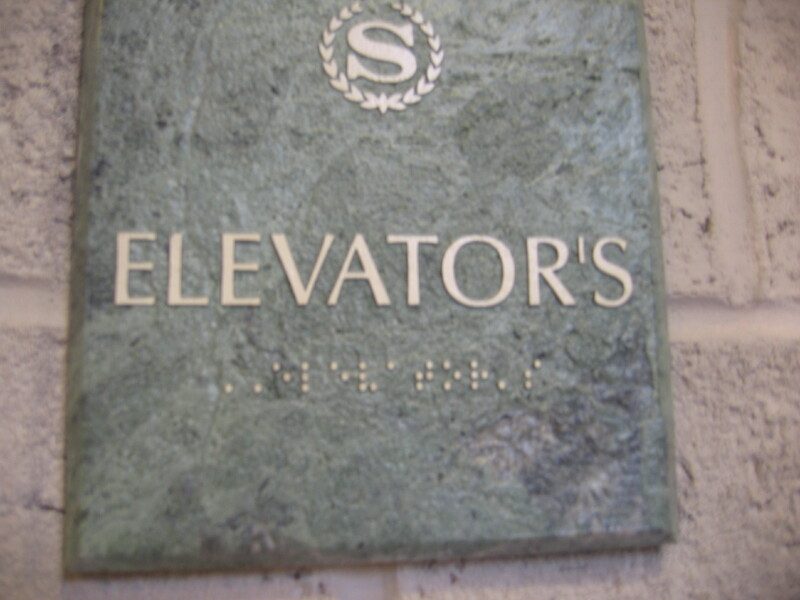 When you add an “‘s” to the back of the word elevator, you’re showing that the elevator is possessing something. Hopefully it won’t be whoever walks into the elevator, because that has B-level horror movie written all over it, and if that’s the case, I refuse to use the elevator at that hotel. Finally, I wonder what it says in braille? So what did I do about it? Well, I took this picture, because really, what can I do about it? Every fiber of my being wishes I could take a chisel and get rid of it, but I probably would have ended up in jail, regardless of my pleadings that I couldn’t go another day with seeing an erroneous apostrophe on their wall. And here you see where what I call “my [sic] world” was born. In writing, if you’re quoting something somebody else wrote and you know there’s an error, but there’s absolutely nothing you can do about it, you put the adverb sic — a Latin word that means “intentionally so written” — in brackets. So I’ve begun documenting the errors I see that make it out in this crazy world of ours, and in my head I’m screaming [sic] [sic] [sic]! It’s my little way of acknowledging the errors that I see, about which I can do absolutely nothing. I had a blog about this long ago that had a tiny following (meaning my friends Mason, Heidi, Ryan and Ronnie), but most of that content was lost when it was eaten by savage beasts. Then I used them to make some direct mail postcards that never got printed. And eventually, I will probably make a coffee table book that Mason, Heidi, Ryan and Ronnie might buy, unless I give it to them first. In short, this is a bit like therapy for me. And no, I have no idea how I wasn’t beat up as a child. you should have taken a red sharpie and drew the proof reader’s mark on the apostrophe (note the proper use there!). that would have been funny! I keep wanting to make a stamp of my little icon, then I’ll start using those marks and leave my own mark behind. Graffiti! p.s. I bookmarked your page! Your sickness is shared, my friend! I want to die every time an error like that stares me down in a public space. I remember there was a muffler place in town that for a solid year advertised on the marquee “Fake Duels, $250.00” I always visualized one of those clown guns that has the “Bang” flag drop from it when you fire it. Worse, as one of the managers at my work I am able to see corporate memos. We recently received one with suggestions about wording for our marquees. It spelled “marquees” as “marquis.” I laughed, and then I almost cried. When I pointed it out to our GM he said it was probably the fault of some spellchecker. No doubt! I would totally buy that book, even if it might make me cry. I LOVE this!! For a while in NYC, I used to carry a bottle of WhiteOut for apostrocatastophes and other pecadillos. I volunteer to be a member of your army…midnight chisel raids and all! !